Renuzit® Sensitive Scents is a new formula designed to please you and your loved ones with sensitive noses. It performs without overpowering. 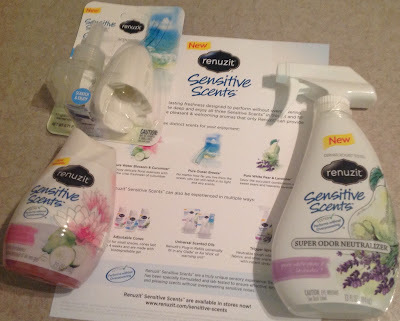 Cassandra's Review- I really enjoyed being able to try the NEW Renuzit® Sensitive Scents with my family. I like the adjustable scent cone the best as far as the way I can use it and places to put it. The plug in does use electric and needs a standard outlet in order to use it properly. The spray is easy to use, but you do have to be very careful where and how much you spray at a time. The new scents are very pleasant and strong. I like how I can still smell it even after an hour or so. The plug in puts out the most scent and is extremely noticeable, but like I had already mentioned it does require electricity. Overall I am still very pleased with the brand and can not wait to see what new products and scents come out in the future. The giveaway is open to the US only. The winner will receive a coupon by mail in which to go to the store and purchase for themselves any one free Renuzit sensitive scent product value up to 5.00 and the coupon expires on 12/31/2016. Cassandra M's Place is not responsible for going to the store and purchasing this for you. The winner will have to provide a valid US mailing address. This would be a gift for my daughter-in-law. Thanks. I would give it to my mom because her nose is super sensitive. I would keep this for myself because my living room needs freshened up.